Saturday afternoon, Clearfield take on Punxsutawney for the District 9 AAA championship. The Bison are looking for their 5th consecutive district title and 13th overall. A win would also give the Bison 8+ wins for the 6th time in the past seven seasons. The game kicks off at 1 p.m. at E.J. Mansell Stadium; more information on the game is listed below. 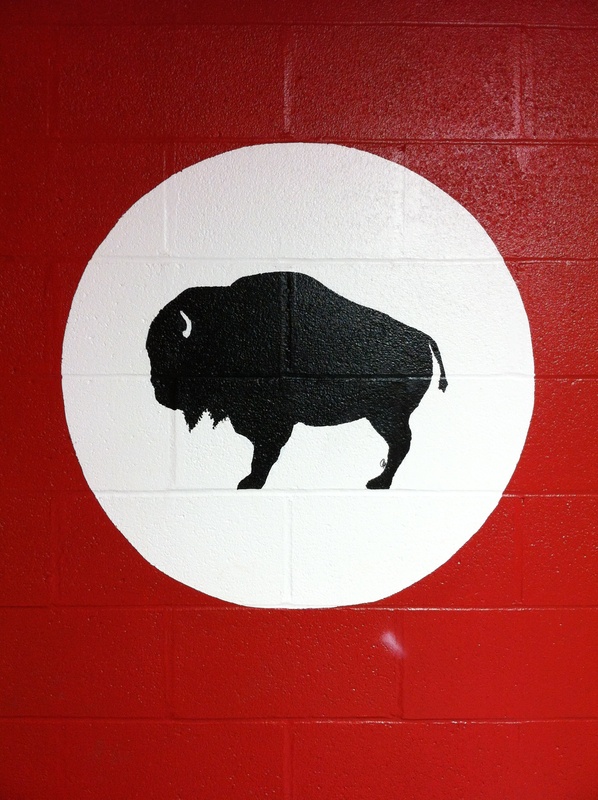 The Bison have faced Punxsutawney more than any other team except DuBois. Since first meeting in 1924, Clearfield and the Chucks have split their 89 meetings, with the series standing at 43-43-3. The Bison have outscored the Chucks 1,377 to 1,298 all-time. For much of the two schools’ histories, they formed two-thirds of the “Big 3” along with DuBois. The team that beat the other two each season was awarded the Big 3 Trophy, several of which are on display in the CHS lobby. The Bison won the Big 3 Trophy outright 16 times: 1924, 1927, 1930, 1939, 1955, 1958, 1982, 1983, 1989, 1993, 1994, 1998, 2001, 2002, 2003, and 2006. The Bison beat Punxsutawney but tied DuBois in 1950 and beat the Beavers but tied the Chucks in 1988. Clearfield has played in 18 District 9 championship games – 3 in AAAA and the rest in AAA. In those 18 games, the Bison have gone 11-7. The 1989 team was named district champions because no district playoff existed that year. The Bison and the Chucks have squared off in four district championship games, with Clearfield winning three. Punxsutawney’s only win came in 2009 by a score of 34-28. The two teams also faced one another in the 2012 District 5/6/8/9 Subregional playoffs where the Bison won, 38-18. Erik Sellers is 126 yards from 1,000 on the season and 37 yards from 1,000 in his career. Nick Kovalick is 11 tackles from tying Matt Meckey (1998-2001) for second all-time in career tackles with 223. Clearfield has now scored at least 50 points against the Mounties in 3 of their past 5 meetings since 2010. Since 2001, the Bison have averaged 44.6 points per game against P-O (10 meetings). After giving up 35+ points in two of its first three games, Clearfield has held its opponents to 11.3 points per game over the past 6 contests. The Mounties became the 6th team to rush for fewer than 50 yards against the Bison this season. Through nine games, opponents are averaging just 2.93 yards per carry against Clearfield. Offensively, the Bison crossed the 2,000 yard threshold on the ground and went over 3,000 yards of total offense this season. Those totals now stand at 2,143 and 3,117, respectively. For his career, Seth Caldwell sits at 1,609 rushing yards, good for 17th all-time in school history. Erik Sellers sits just 37 yards from becoming the 31st Bison to surpass 1,000 career rushing yards. His 18 rushing touchdowns this year ranks tied for 13th on the school’s single-season list with Dave Richards in 2001. Ryan Lezzer moved into 20th place on the school’s career receiving yardage list. He now has 740 yards in his two years on varsity and is just 20 yards behind Beau Ryan (2003-2005) for 19th place. Lezzer’s 503 yards this season is the 27th 500+ yard receiving season by a Bison. With the win, the Bison held onto the second seed in the District 5/6/8/9 Subregional. They will take on Punxsutawney for the District 9 AAA title at 1 p.m. Saturday in DuBois. This week, the Bison host Philpsburg-Osceola in the final regular season game of 2014. Senior Night at the Bison Sports Complex features two historical rivals who will meet for the 55th time, although Clearfield played Philipsburg High School 35 times and Osceola Mills High School 19 times before the two schools merged in 1956. The Bison are 31-23 all-time against P-O; the team went 18-15-2 against Philipsburg and 14-3-2 against Osceola Mills. Clearfield and P-O played every year from 1956 (when Philipsburg and Osceola Mills merged) through 2003. The two teams didn’t play from 2004-2007 but resumed the series in 2008 and have played every year since. Despite the overall series being fairly close, Clearfield has dominated the matchup in recent years. Since 1992, the Bison hold a 16-2 advantage over the Mounties. P-O’s only wins during that span came in 1995 and 2011. The 2011 win by the Mounties stood as the only regular season loss by the Bison over a span of 42 regular season games stretching from 2009 through the end of 2013. P-O’s 40-33 win featured the 4th most points Clearfield has allowed since the start of the 2008 season. Philipsburg-Osceola also ruined a Clearfield bid for an undefeated season in 1989. The Bison finished 10-1 and just missed out on a state playoff berth in the second year of PIAA playoffs for football. Because the playoffs included only four teams statewide in 1989, the Bison loss to P-O allowed Hollidaysburg to advance to the playoffs over Clearfield. The Progress reported in that year that Clearfield would have advanced had Hollidaysburg fallen to Johnstown in the final week of the season. In 2008, Cruise Kerr set the Clearfield school record for sacks in a game when he recorded 5 against P-O. The Bison won 35-0 and held the Mounties to (-13) yards on 27 carries and (-8) yards of total offense. Chad Kroell – 271 (1994). Kroell also tied his own school-record with 7 TD passes in this game. Clearfield’s 131 yards passing against the Eagles was its most since throwing for 300 yards at Keyser in Week 1. The Bison are currently averaging 238.8 rushing yards per game in 2014. This season would be the 5th year in a row that Clearfield averaged 200+ yards per game on the ground if that average holds up. Clearfield is averaging 351.8 yards of total offense per game through its first 8 games of 2014. That average would rank 8th in school history; last year’s team set the school record with 385.8 yards per game. With 809 passing yards this season, junior quarterback Cody Spaid is 191 yards from earning Clearfield’s 26th 1,000 yard passing season. Erik Sellers now has 15 rushing touchdowns this season, which ranks tied for 17th in school single-season history. Sellers’ total is tied with Ken Wisor (1998) and Tyler Stratton (2012). Senior Dustin Maines now has 8.5 sacks this season after recording one against BEA, tied for 5th in school history with Christian Lezzer (2011) and David Hoover (2010). Maines’ 10 career sacks ranks tied for 14th all-time with Tyson Johnson (2002-2004). Nick Kovalick now has 206 career tackles and has sole possession of 5th place in school history. He is just two tackles behind Jeremy Irwin (1996-1999) and three behind Brandon Hogue (2008-2010), meaning he could sit in third place after Friday’s game with Philipsburg-Osceola. Seth Ford (2011-2013) holds the school record with 253 and is followed by Matt Meckey (1998-2001), who had 223. Spencer Herrington’s 5 made extra points on Friday gave him an even 200 for his career. In four years as the Bison kicker, Herrington is 200 for 209 on extra points and 9 for 9 on field goals, giving him 227 career kicking points. He holds school records in all of those categories. An updated look at the District 5/6/8/9 Subregional playoff standings is included below, thanks to the PIAA District 6 website. Teams will not advanced based on total points, but rather average points because not all teams will play the same number of games. Therefore, average point totals are included in the table below. As noted by D9Sports.com, Clearfield’s District 9 championship game against Punxsutawney will count as a regular season game, meaning that points will be accrued by the winning team to put toward the subregional standings. It also means that the team that loses that game is not automatically out of the subregional playoffs; if the team still has a top-4 point total, it will still advance to the subregional playoffs. With only two weeks remaining in the regular season, both playoff races involving Clearfield are beginning to sort out. D9Sports.com did a thorough recap of the races in their entirety and the Bison appear to be in solid shape while jockeying for playoff seeding. Based on the points given in the D9Sports.com article, the Bison have wrapped up a spot in the district championship game for the 7th straight year and 15th time in the past 16 years. Clearfield has failed to reach the District 9 AAA championship game only once (2007) since becoming a AAA school in 1998. Bradford (1-6) still has three games remaining; if they won all three, their points would max out at 540. Clearfield currently sits at 570 points, so the Bison will face either the Owls or – more likely, based on their current 440 points – Punxsutawney. Things are more up in the air regarding the District 5/6/8/9 Subregional playoffs. Clearfield (570 points) currently sits in second place behind Somerset (720). University Prep (520) and Punxsy (440) round out the top four, the number of schools that will advance into the subregional playoff. However, the Chucks sit just 20 points ahead of 5th-place Johnstown. Punxsutawney has two games left: versus 1-6 Clarion-Limestone and at state-ranked Karns City. Johnstown plays three games: versus Forest Hills, at Bishop Guilfoyle (PFN’s No. 4 team in Class A), and versus Cambria Heights. University Prep’s upcoming schedule includes just one game: at Steubenville (OH) this Friday. A win over the 4-3 Big Red could lead University Prep to a close race with Clearfield for the second spot in the subregional. The four teams in the subregional would meet in a #1 vs. #4, #2 vs. #3 bracket, but gaining the higher seed would give either University Prep or Clearfield a home game in the subregional semifinal. The Eagles are 2-5, having beaten Philipsburg-Osceola (42-17) and Huntingdon (32-12) and suffering losses to Moshannon Valley (27-7), Penns Valley (28-6), Chestnut Ridge (26-0), Central (40-0), and Tyrone (42-6). Last week’s victory over Huntingdon snapped a four-game stretch where Bald Eagle was outscored 136-12. Clearfield’s 26-14 win at Tyrone last week caused a logjam at the top of the Mountain League standings. The Bison and Central are each 4-1 while Tyrone is 5-1; neither of those three teams beat the other two, with Clearfield falling to Central, the Dragons losing to Tyrone, and the Eagles losing to Clearfield. The Bison are 25-17 (.595) all-time versus BEA in 42 meetings. The two schools began playing one another in 1964. Friday will mark Clearfield’s last regular-season road game of 2014. The Bison are 3-1 on the road this year and haven’t lost more than one road game in a season since 2008. Clearfield is 25-3 (.893) on the road since the start of the 2009 season and 54-15 (.783) in road games since the start of the 2000 season. The Bison are allowing 103.6 rushing yards per game, the program’s lowest mark since the 2004 team gave up just 79.7 yards on the ground per game. Keyser (311) and Bellefonte (259) each had success running the ball against Clearfield, but none of the Bison’s five other opponents have had more than 50 yards rushing. Dave Richards set the school record for single-game rushing yards against BEA in 2002 with 16 carries for 363 yards and 7 touchdowns. Chad Kroell set the then-school record for passing yards in a game with 335 against Bald Eagle in 1993. Kroell would break the record twice the following season, but his performance against the Eagles still ranks 3rd on the school’s list. In that same game, Bison receiver Wes Dahlem caught 9 passes for 208 yards, a total that still ranks 3rd for receiving yards in a single game in school history. In all, 3 Bison have rushed for 200+ yards against BEA, most recently Tyler Stratton (203) in 2013. Terry Briskar was the first to do so, racking up 264 yards on a school-record 46 carries against Bald Eagle in 1968. Two Clearfield quarterbacks have passed for 250+ yards against the Eagles, with Curtis Frye (285) joining Kroell in 2009. D9Sports.com publishes a district-wide weekly Top 10; this week, the Bison check in at No. 6. The website also features predictions for each matchup, which can be seen here. Clearfield has now won four of its past five meetings with Tyrone and each team the Bison have beaten during that stretch was a quality opponent. The Golden Eagles went 10-2 and were riding a 35-game regular season winning streak when they fell to the Bison, 35-34, in 2008. Tyrone went 8-4 in 2012, 9-3 last year, and were 6-0 this season before Friday’s loss. Erik Sellers now has 1,165 career rushing plus passing yards, putting him at number 37 on the school’s all-time total offense list. He is just 28 yards behind Bill Miller (1937-1939), who finished his career with an official total of 1,193 yards of total offense. Sellers sits at 719 rushing yards this season, putting him 281 yards from becoming Clearfield’s 25th 1,000 yard rusher. Seth Caldwell is close behind Sellers, needing 315 yards to also rush for 1,000 yards for the first time in his young career. Caldwell currently sits at 1,485 career rushing yards, good for 18th place on the school’s all-time list. He needs 28 yards to pass Justin Ingram (1994-1996) for 17th place. With 7 tackles Friday night, Bison linebacker Nick Kovalick passed the 200 tackle mark for his career. With his 201 career stops, Kovalick is currently in 6th place on the all-time list and is just 9 tackles from taking over 3rd place. He passed former Bison Justin Karp (2005-2007), who had 199 career tackles, and Dennis Yohe (1995-1997), who had 196. With Friday’s win, Clearfield is now 57-8 in its last 65 games, including 46-3 in its last 49 regular season games. The Bison will travel to Wingate on Friday to take on Bald Eagle Area. In all, 23 of the 65 all-time meetings (35%) between the schools have been decided by 9 points or less. Clearfield is 27-35-3 against Tyrone all-time, but Clearfield has won 6 of the past 7 games dating back to 1989. The two teams met every year from 1941 to 1977 but Friday will only be the teams’ 14th meeting since then. The two teams’ first meeting was a scoreless tie during the 1925 season. The only older series that Clearfield has that are still played are Bellefonte (1913) and Huntingdon (1914). If the all-time series with Philipsburg-Osceola is split into the two merged schools, they also began before Tyrone (Philipsburg: 1909, Osceola Mills: 1914). Clearfield may meet up with Punxsutawney in the district playoffs; that series began in 1924. From 1960 to 1976, the Bison and Golden Eagles played 17 times, with Tyrone going 15-1-1 in that span; they won each matchup from 1964-1975. This season, Tyrone is scoring an average of 36.8 points per game and allowing 10.7 ppg. Clearfield is averaging 31.3 ppg and allowing 19.2. In 1976, Clearfield gained just 36 yards on 41 carries and had only 92 yards of total offense but tied Tyrone 14-14. The Bison averaged only 1.7 yards per play during the game but two Pat Davis rushing touchdowns preserved the tie. Clearfield actually gained 107 yards rushing but lost 71, leading to a net of 36 yards. Despite playing Tyrone more than nearly any other opponent, no Bison has ever rushed for 200+ yards, passed for 250+ yards, or caught 125+ yards in passes against a Tyrone team. Sophomore Seth Caldwell now ranks 18th in school history in career rushing yards with 1,404. He is 108 yards behind Justin Ingram (1994-1996) for 17th place. Fellow sophomore Ryan Lezzer ranks 24th in career receiving yards with 631, two yards ahead of Chris Dixon (1984-1986) and 28 yards behind Dave Spingola (1978-1980) on the career list.